I need to print bar code labels - what are the options ? Buying an "off the shelf" bar code labelling and printing package that can run on your office PC, along with your existing dot matrix, ink jet or laser printer, is a viable option for many. The principal benefit of this approach is the relatively low initial cost. » You will need to load the printer with label stationery so, unless you dedicate a printer to the labelling task, other printing must be suspended. » You are generally limited to paper labels, not ideal if you need robust and scratch-resistant labels. » Printing one label may waste blank labels, particularly with laser printers. This approach is therefore less suitable if you are likely to require varying quantities of labels "on demand". » Labels for office printers are often of the permanent adhesive type, which may not be ideal for all applications. » Dot matrix printing of bar codes requires some care. 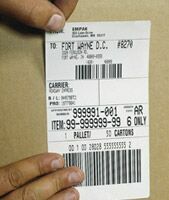 Because each bar is made up of dots, it is not always possible to produce the dead straight dark edges that bar code readers generally require. However, with care it is possible to produce readable codes on even a 9-pin dot matrix printer. 24-pin printers give better results. » Ink jet printers can suffer from similar problems as dot matrix printers. Problems arise especially when printing on absorbent paper as the ink can spread on the page causing the edges of the bars to be blurred. » Beware also that worn printer ribbons, damaged pins and low ink/toner are common causes of badly printed and unreadable bar codes. » On demand printing, giving the precise number of labels you need at a given time without wastage. » When used with suitable label stock and ribbons, thermal transfer printers can produce very durable, scratch-resistant labels. » Thermal transfer printers normally produce very high quality bar codes of good definition. » Speed; these printers can print labels very fast, often up to 26cms of label material per second, making them ideal for high volume applications. The biggest downside to thermal transfer printers is the higher initial cost. Because these are specialist printers that are not made in the same mass produced quantities as office printers, they do cost more. However, it is often worth considering the overall running cost, in terms of cost per label, over the expected payback period. The higher initial cost can often be significantly offset by a lower overall cost per label. When volume label production is required, thermal transfer is usually the best and most cost-effective option. If you choose thermal transfer printing, you will also need to consider software to drive the printer. The two main approaches here are either to use a PC package that supports the appropriate printer, or to drive the printer directly from your application software. Driving the printer directly is not as complex as it might at first seem. Thermal transfer printers are usually controlled by sending the printer special control commands in a similar fashion to the way ordinary printers are software controlled. Most bar code label printers are supplied with Windows drivers. If you are producing your own software for the main application (or having it produced for you), it should be quite viable to include the correct sequences to control the printer. Some label printers are 'direct thermal' and some are 'thermal transfer' - what's the difference ? Direct thermal printing uses coated paper that turns dark when exposed to heat, similar to the older type of fax paper. As the paper passes over the print head, the image is "burned" onto the paper. The major downside to direct thermal printing is that you need to use specially coated paper. Also, the images on coated paper will eventually fade, giving a useful life sometimes of no more than three months, although full barrier coated labels can last for up to two years. Thermal transfer is a different technique. Here a ribbon (also known as a "foil") is used. The ribbon consists of a clear liner or carrier coated with wax, resin or a wax-resin compound. It is heated by the print head and the wax or resin transfers onto the label creating the image. Labels produced in this way are much more durable than direct thermal labels. Resin based ribbons especially provide a very durable print that can be resistant to abrasion and chemicals. With thermal transfer you are not limited to paper for your labels. Filmic bases such as polyester provide labels with long life and substantial resistance to abrasion and chemicals for harsh environments. Can I use pre-printed labels ? The answer here is very dependent on the nature of the application and what you are trying to achieve. Clearly, if you need variable data - or unique and specific information that is not previously known - represented in your bar code, then pre-printing may not be a viable option. On the other hand, if you are only intending to use the bar code as a form of identifier, then buying sequentially numbered pre-printed labels (e.g. 1000 labels numbered 000 to 999) can be highly cost effective. For example, in an asset identification application, you might assign the bar coded number 4567 to the office photocopier by attaching the bar code label to the copier and recording that this number is now the identifier for this item. Your asset database will now know that the number 4567 represents the photocopier; once a number is assigned, it does not change and remains unique to that particular asset. One note of caution though: ensure that you keep a record of the ranges of numbers you have used and make sure that you never re-use the same number twice - otherwise great confusion could ensue! Naturally, if your application requires that "all of x have the same number", then identical pre-printed labels would be required.